Verizon Wireless has launched a television and online advertising campaign for the Droid, a new Android 2.0 powered smartphone being released in November. Advertising centers on the claim that the phone will do all the things the iPhone doesn’t do, including having a real keyboard, running widgets, taking night shots, running simultaneous apps, being customizable, and allowing open development. The 30-second commercial opens with a white background, simple text and the lyrics of an unknown pop song, “It’s magic”. We’re provided with a list of features the iPhone doesn’t run, each beginning with “iDon’t”. “All the things your phone doesn’t do, Droid Does”. Halfway through the ad the music stops and transmission appears to be interrupted by a high-tech announcement with the web site, www.DroidDoes.com. 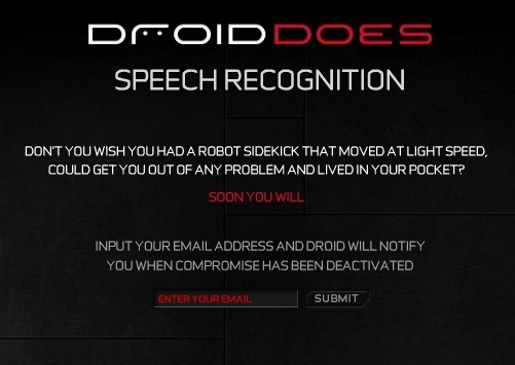 “Everything iDont, Droid Does”. The Motorola Droid is an Android-based smartphone by Motorola, previously publicized under the codenames Sholes and Tao. It will be distributed by Verizon Wireless in the United States. Features of the phone include Wi-Fi networking, a 5-megapixel digital camera with flash, a standard 3.5 mm headphone jack, interchangable battery, 3.7-inch 854×480 touchscreen, 16 gigabytes of onboard flash, MicroSDHC support, and a QWERTY keyboard. Its processor is a Texas Instruments OMAP 3430. Oh, oh oh oh oh oh oh oh oh! Look at the sun way up there in the sky! The world is so bright! The Verizon Droid IDon’t Do campaign was developed at McgarryBowen by executive creative directors Mark Koelfgen and Warren Eakins, creative director/art director Aaron Adler, creative director/copywriter Mark Abellera, art director Michael Cannova, copywriter Tiffany Smith, agency producer Chance Basset, music producer Jerry Krenach working with Mozella. Design was produced at Elastic by creative director Shaun Collings, designers/3D artists and 2D animators Eric Demeussy and Jiaren Hui, producer Paul Roy, and executive producer Jenn Sofio. Visual effects were produced at A52 by 2D VFX Artist Paul Yacono. Sound was designed by Eric Demeussy at Marshall Grupp with sound mixer Tom Jucarone.